The ‘Cheerful Giving’ began when the Sunday School together with the Christian Friendship Group (CFG) started sending gifts to the children at Canaan Land Ministries (CLM) and Green Olive Tree Ministries (GOTM). Both of these Ministries are in Brazil. The items the children would receive were; fun toys, candy, colouring books, basic things like socks and underwear etc. Families made their gifts very personal by sending pictures and notes along with the packages. It was a special time for our church families, drawing their attention to orphans and less fortunate children. The adventure of purchasing and giving was such a blessing. Due to increasing shipping costs the time came to reevaluate the way we were using the Lord’s bounty. We decided to spread our giving in a new way. The idea was shared that we could work together with our Sister Church’s World Relief effort. For a time we were involved with that however we faced shipping difficulties. We were made aware of an option that took away the border hassles. It was then that we partnered with the Mennonite Central Committee (MCC) whose well established relief efforts matched our needs as well. 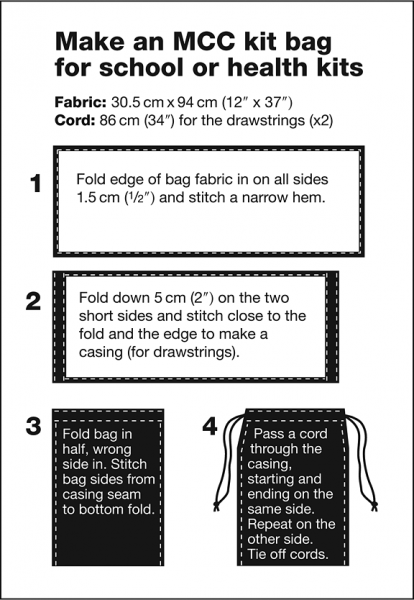 There is a sewing group in Kitchener that meets weekly to sew draw string bags and teach young people how to sew. We currently package around 8000 kits per year and it even caught the attention of local media a few times. To see the article from the Kitchener Waterloo Record, click here. To view a presentation on the Cheerful Giver program, click here. To see a video on preparing and packaging hygiene kits, click here. Matthew 25:40 – “Inasmuch as ye have done it unto one of the least of these my brethren, ye have done it unto me”. Prayers that the kits may be used as a way of showing needy people that God loves them and has not forgotten about them. Funding to allow ACCMBC to continue purchasing supplies in bulk. Volunteers to assist with packaging on the announced days. To discuss opportunities for this cause, please contact the chairman or the Cheerful Giver contact person at your local Apostolic Christian Church.